(3rd Bn.) 12 Apr 1943 28 Son of Pte. Frederick Abbotts, North Staffordshire Regt. (killed in action in France, 13 Oct 1915), & of Mary Ann Abbotts, of Halkyn. Enfidaville War Cemetery, Tunisia. 1457833 Royal Artillery 26 Sep 1944 29 Son of William John and Katharine Alcock; husband of Anne Alcock, of Calcot, Holywell. Gradara War Cemetery, Italy. (6th Bn.) 15 Apr 1945 18 Son of William Edward & Elizabeth Carrington, of Greenfield. Becklingen War Cemetery, Niedersachsen, Germany. 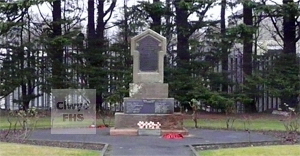 1670972 Royal Air Force Volunteer Reserve 16 Apr 1943 20 Son of Hugh & Sarah Ann Evans, of Bryn Celyn, Holywell. Assiniboia (Mount Hope) Cemetery, Saskatchewan, Canada. Reginald R Dec 1947 27 Born Wigan, Lancashire, England. Husband of Lucy Fowler (nee Alker). Died in Hawarden, Flintshire. (71 Anti-Tank Regt.) 11 Mar 1944 25 Son of Mr & Mrs H Harrison, of Greenfield; husband of J M Harrison, of Park Gate, Southampton, Hampshire, England. Greenfield Cemetery. (2 Troup Carrying Coy.) 10 Feb 1940 33 Son of Harold and Martha Holland, of Bryn Clyn, Flintshire. Orchard Dump Cemetery, Arleux-en-Gohelle, Pas de Calais, France. 14436554 Royal Welsh Fusiliers (6th Bn.) 2 Aug 1944 19 Son of Morris Hopwood, and of Ethel Hopwood, of Oldham, Lancashire, England. Banneville-Le-Campagne War Cemetery, Calvados, France. (3rd Bn.) 28 Nov 1944 18 Son of Fredrick Albert & Isabella Jones, of Greenfield. Venray War Cemetery, Limburg, Netherlands. (S.S. Anking) 4 Mar 1942 27 Son of John & Sarah Jones; husband of Margaret Jones, of Holywell. Sunk by Japanese cruisers, 200 km east of Christmas Island. Chatham Naval Memorial, Kent, England. (H.M.S. Penelope) 18 Feb 1944 19 Son of William and Elizabeth Kelford, of Greenfield. Torpedoed by a German submarine off Naples, Italy. Plymouth Naval Memorial, Devon, England. 4191051 Irish Guards 6 Nov 1940 23 Son of Harold & Amy Rees, of Holywell. Greenfield Cemetery. (194 Sqdn.) 6 May 1944 21 Son of Edward & Caroline Roberts; husband of Mona Phillips Roberts, of Greenfield. Singapore Memorial, Singapore. (3rd Bn.) 9 Apr 1943 26 Son of Edward and Alice Roberts, of Greenfield. Enfidaville War Cemetery, Tunisia. (68 Bty., 186 M H.A.A. Regt.) 17 Nov 1943 39 Son of Peter & Elizabeth Ann Seville; husband of Sarah Harriet Seville, of Cefn y Bedd, Flintshire. Greenfield Cemetery. (7th Bn.) 11 May 1940 25 Son of John Price Williams & Martha Williams, of Greenfield. Estaires Communal Cemetery & Extension, Nord, France.